They’ve traded the battlefield for the classroom, but they still hear the echoes of gunfire and bombs. And most of their fellow students come from a different world. For students who are striving to adjust to a world of books and term papers after a tour of duty in a war-torn country, Wright State University has created military-only classes for students who are veterans or currently serving in the U.S. military. Military-only classes, created by the Veterans and Military-Connected Committee with the support of faculty, offer a safe space for those who are returning from combat situations and a comfortable atmosphere for veterans. “They may be freshmen in terms of where they are in the system, but they are mature beyond their years,” said Larry James, dean of the School of Professional Psychology. Though the School of Professional Psychology is separate from the Department of Psychology, James volunteered to teach the military-only section of Psychology 101. James is a veteran: a retired army colonel with 22 years of active duty under his belt. He is former chair of the psychology department at Walter Reed Army Medical Center. James said that Wright State is one of very few institutions that offer a program like this. 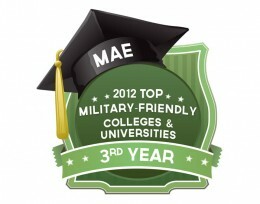 University of Louisville, George Mason and Cleveland State offer similar military-friendly classes. James and English instructor Sarah McGinley teach the two military-only classes offered at Wright State. Both said that in the future, they hope the program will expand to offer many general education classes. The idea, James and McGinley stressed, is not to create a separate track for military students, but to ease them into college life until they’re ready for larger, more diverse classes. These military-only classes are also ideal for students still involved in the military. The attendance policies are flexible, allowing students to travel for training or for other duties. McGinley tries to do just that in her class, where her students often take breaks to get up, stretch their muscles, even go out for a short walk. “You’re sitting with people who know who you are,” said Joshua Swan, a staff sergeant in the U.S. Army. Swan is currently on active duty and working full time for the National Guard. He was particularly grateful for the flexibility and understanding of his classmates and professor when he missed the first several weeks of class for work. That type of discipline is common in these classes. There’s no texting under the table or interrupting the professor. Mutual respect, hard work and understanding are a huge part of what makes these classes special. But fun is definitely a part of the picture too. James, McGinley and their students are serious about the subjects they’re studying, but that doesn’t mean the classes are grim and silent. “They know how to strike this balance well, between being relaxed, being a little bit goofy, and ‘all right, now we’re doing this,’” McGinley said. The instructors are trying to strike a balance too; they want to provide support for military students, but they don’t want to isolate them in a separate track. These classes are all about helping students integrate into campus life. The classes are a way for Wright State to continue its partnership with the military and help students who might need the safe space McGinley and James’ classrooms provide. They also hope that Wright State will become a first choice for many military students looking for places to apply. The school has been rated a military-friendly school by G.I. Jobs and Military Advanced Education.